At Mark Spencer Hotel, we strive to ensure each guest has a memorable experience with us. Our dedicated staff provide exceptional, personalized services, while our on-site amenities ensure guests have everything they need to enjoy a relaxing getaway. 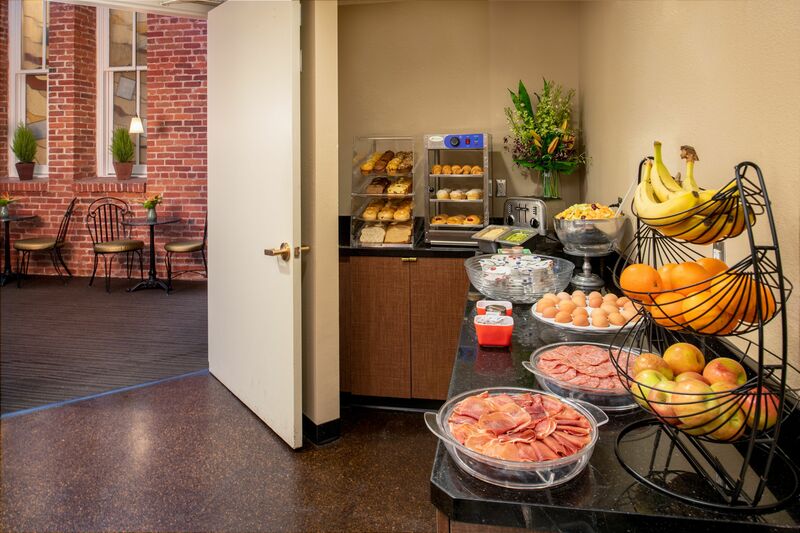 Our hotel with free breakfast in Portland, Oregon is your best place to stay when visiting The Rose City. Explore our long list of amenities below, and book your stay with us today. Breakfast is served in our atrium on weekdays from 6 AM- 10 AM, and weekends from 6 AM - 10:30 AM. 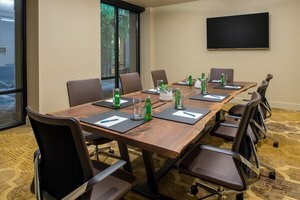 On-site meeting & event space: Our dedicated staff is here to make your meeting a success. Small board meetings, brainstorm sessions or conferences, the Mark Spencer Event Center is here to help execute a memorable event. Visit our meetings & events page to learn more. Coin laundry & dry cleaning services: you’ll always have a fresh outfit for an important meeting or event with our on-site laundry services. Business Center: Focus on the task at hand at our business center off the lobby, equipped with a computer. Guests can use printing and copying services at the front desk. Concierge service: Enjoy easy assistance in making a reservation for a business lunch or information about our transit system. Our lobby features a state-of-the-art espresso machine, available to guests 24 hours a day for made to order Lattes or Cappuccino with a variety of milk options. Each coffee is brewed with our incredible in-house roasted beans. From 3 PM - 6 PM each evening, we provide our guests with fresh baked cookies in the library. 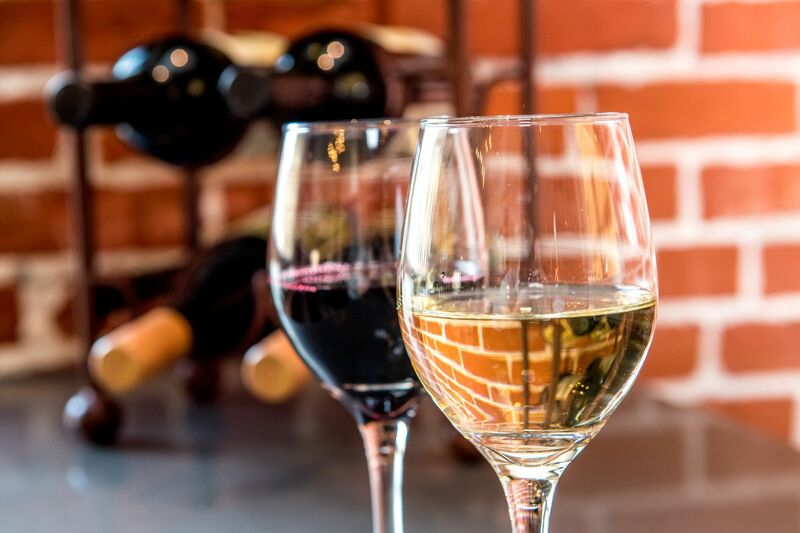 Each evening, we welcome our guests to an evening wine reception featuring west coast wines. Stop by and sample some incredible local drinks and snacks while getting to know the other guests! Guests can spend a day exploring our grand hotel, there’s a ton of relaxing amenities available on-site to help you enjoy a relaxing day at the hotel. 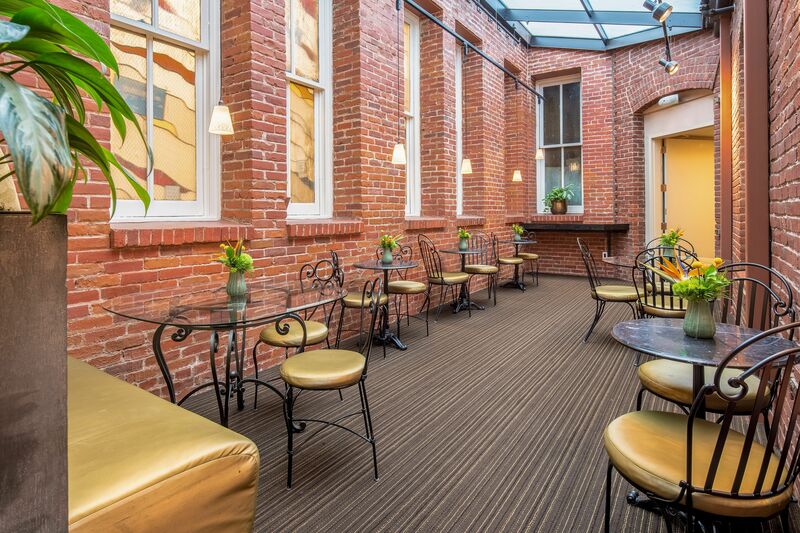 Spend an afternoon lounging in our outdoor courtyard reading a complimentary New York Times. Break a sweat in our on-site fitness center! Equipped with cardio machines, free weights, exercise balls, and more, we have everything you need to enjoy a great workout. Relax before heading out to explore the city in our lobby area, called the Library. Grab one of our discount passports to enjoy major savings on a ton of local attractions, restaurants, and activities! Book your stay at our hotel with free breakfast in Portland, Oregon to enjoy our range of deluxe amenities and services.